"A fun, trendy cocktail great for parties. 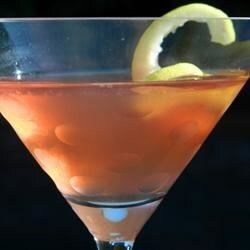 Innovative twist on a classic martini, enjoy!" Measure the vanilla vodka, limoncello, pomegranate juice and lime juice into a cocktail shaker. Add several ice cubes, seal the lid and shake until frosty. Strain into a martini glass and garnish with a lemon twist. This is the same drink recipe that Caravella Limoncello has in their ad. This was a little sweet for me and the pomegrante juice overpowered the coccktail. Just yummy! We added half a shot of regular vodka just to increase volume and cut some of the vanilla taste. Defiantly a keeper drink, it almost tastes like a fruity cheesecake. The pomegranate flavor does not come through on this drink. It taste just like a lemon drop martini. Which is not a bad thing, just no pomegranate flavor. It make a pretty drink though.